You can find HERE my Log Cabin tutorial. 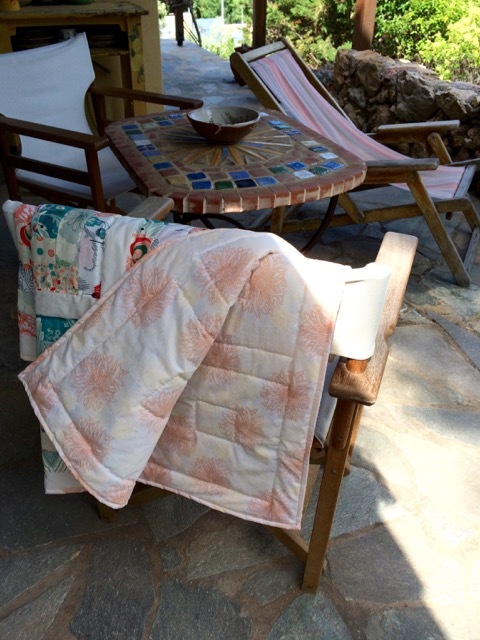 HERE the references for the measurements of this baby quilt and the fabric line I used. Wishing you all a beautiful summer holiday! Your quilt looks great. I'm sure the baby will treasure it for years to come. Hope you back continues to mend. Enjoy your time in France. 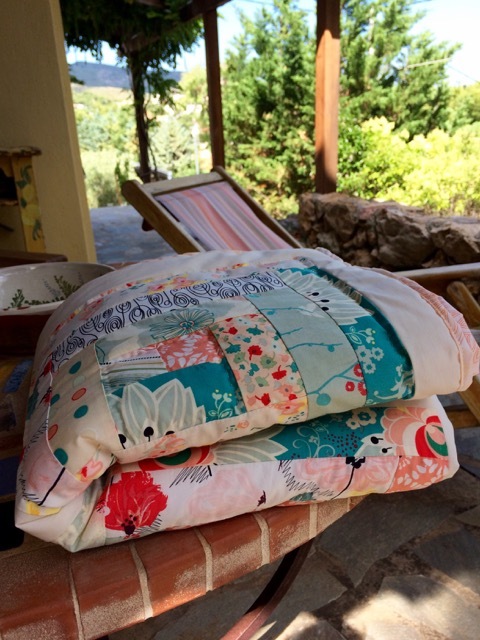 It's a lovely, summery quilt! Hope you heal quickly; I'm so sorry to hear that you have a back injury! 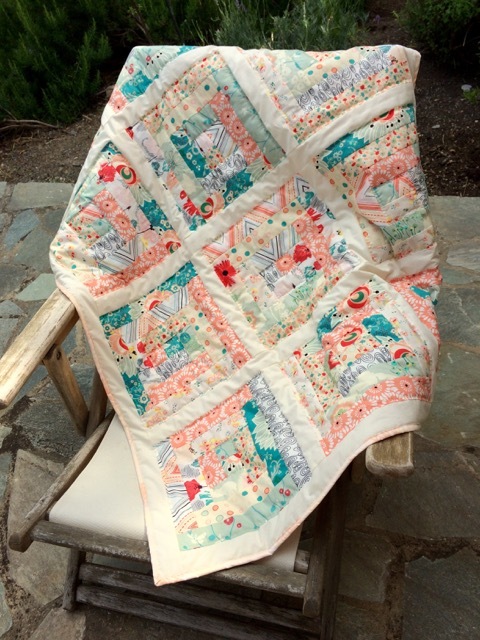 I might be basic, but it is still a lovely quilt, it looks light and airy. It's beautiful. The white sashing sets off the lovely prints. The basic quilting makes it even more cozy and soft. Have a wonderful summer in France! Basic basic ... basically beautiful I would say. Just lovely ! So happy to hear that you have recovered Christine! Wishing you a wonderful vacation in France! 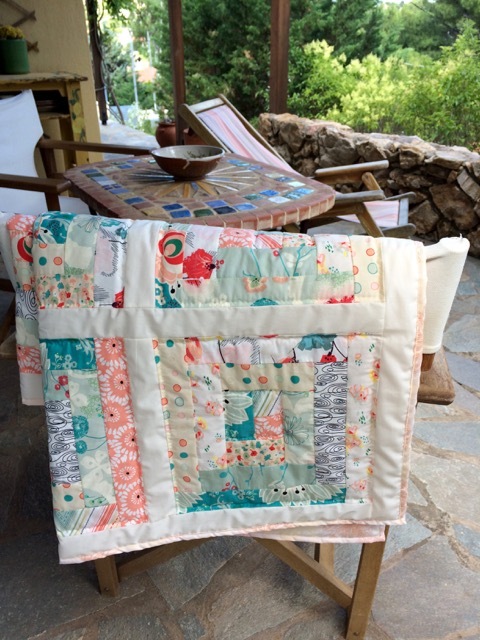 I'm so pleased to read that you were able to do a little quilting, the baby quilt is delicious! Hope you enjoy your summer back in France and post again when you're able to do so. This is beautiful, Christine. This quilt is sure to become a family treasure. Enjoy the summer, my friend, and take good care. Very sweet, Christine! I'm sure your granddaughter will love it to bits. Such pretty colors and modern fabric for a favorite classic quilt. I hope you had a beautiful summer and are feeling better!